ARTICLE VI. – RENEWABLE PARALLEL GENERATION POLICY. There is hereby adopted the Interconnection Standards for Installation and Parallel Operation of Customer-Owned Renewable Electric Generation Facilities 25 kWAC or less for Residential Customers and 200 kWAC or less for Commercial Customers (“Interconnection Standards”). 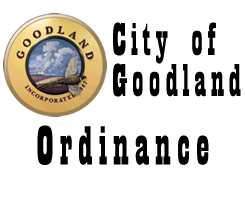 Service is available on the City of Goodland’s (“Utility”) existing electric distribution system for customers operating Renewable Energy Resources. The service is available to customer-generators on a first-come, first-served basis until the total rated generating capability of all interconnections served under Parallel Generation equals or exceeds four percent of the City’s peak load for the previous calendar year. Upon reaching this limit, no additional service shall be available under this policy. This policy shall not be available for any electric service schedule allowing for resale. Service under this policy is available to Utility customers in good standing with a customer-owned renewable electric Generation Facility as defined in the Interconnection Standards that wish to receive a billing credit for surplus renewable energy supplied to the Utility subject to the terms and conditions of this policy. Customer-owned renewable generation and associated equipment are collectively referred to as a Generation Facility. Utility may refuse interconnection of any generating facility with a rated generating capacity greater than Customer’s annual peak electric load. Sec. 17-604. Character of Service. Single phase, 60 Hertz, alternating current will be supplied at standard voltages as available through one transformer. A qualifying customer is a customer in good standing, connected to the Utility Electric Distribution System for the purpose of receiving retail electric service that also owns and operates a Generation Facility as defined in the Interconnection Standards for Installation and Parallel Operation of Customer-owned Renewable Electric Generation Facilities. The Generation Facility shall be installed and operated in accordance with the requirements of said Interconnection Standards. The minimum monthly charge set forth in Chapter 17, Article II of the Code of the City of Goodland plus the Capacity Charge shall be the minimum bill. Any credits ($) applied to the bill will not result in a total bill less than the Minimum Bill. Metering shall be accomplished by use of a Utility-approved electric meter or meters capable of registering the flow of electricity in each direction. The Utility may, at its own expense and with written consent of the Customer, install one or more additional meters to monitor the flow of electricity. The measurement of net electricity supplied by the Electric Utility and delivered to the Electric Utility shall be calculated in the following manner. Electric Utility shall measure the amount of electricity delivered by Electric Utility to Customer and the amount of electricity generated by the Customer and delivered to Electric Utility during the billing period, in accordance with normal metering practices. The kWh delivered by Electric Utility to the Customer shall be billed to the Customer at the rates contained in Chapter 17, Article II of the Code of the City of Goodland. The kWh generated by the Customer and delivered to the Electric Utility shall be credited as described in Customer Billing Credit below. The calculated credit ($) applied to the bill will not result in a total bill less than the Minimum Bill. Sec. 17-609. Customer Billing Credit. The billing credit for surplus energy generated by the Generation Facility and delivered to the Electric Distribution System that exceeds the Customer’s instantaneous load but is not in excess of the appropriate generator size, the City shall credit one hundred and fifty percent (150%) of the City’s actual cost of purchased energy ($/kWh) for the periods in which energy was delivered to the City. Sec. 17-610. Terms and Conditions. The Utility shall offer this Renewable Parallel Generation Rate Schedule to Customers that wish to receive billing credit for surplus renewable energy supplied to the Utility from eligible Customer-owned Solar Generation Facilities. The Utility may limit the number and size of renewable generators to be connected to the Utility’s system due to the capacity of the distribution line to which such renewable generator would be connected, and in no case, shall the Utility be obligated to purchase an amount greater than 4% of Utility’s peak power requirements. This Schedule shall only be available to Customers in good standing. All agreements hereunder shall be between the Customer and the City and will not include third parties. This Schedule is subject to the provisions of the Interconnection Standards for Installation and Parallel Operation of Customer-owned Renewable Electric Generation Facilities. The Interconnection Agreement between the Utility and Customer must remain in effect and the Customer-Owned Generation Facility must be in full compliance with the terms and conditions of the Interconnection Standards. Any required insurance coverage is specifically addressed in the Interconnection Standards. Nothing in this Schedule shall abrogate any Customer’s obligation to comply with all applicable Federal, State and Local laws, codes or Ordinances. SECTION 2. This Ordinance shall take effect and be in force from and after its publication in the official City Newspaper. PASSED AND ADOPTED this 5th day of November, 2018 by the Governing Body of the City of Goodland, Kansas.